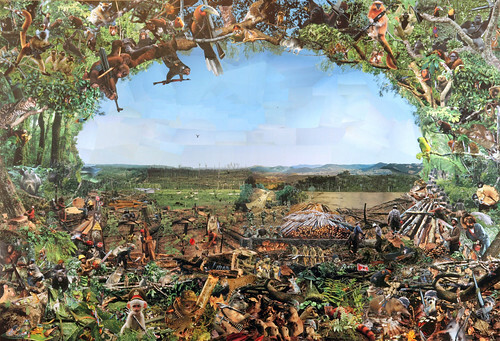 Every photo is cut out of National Geographic magazines and glued down onto collaging board. A herd of cows grazing on a newly deforested region of Brazil’s Amazon basin. Fast food restaurants in the U.S.A. including McDonald’s buy this meat, even though they deny any involvement in deforestation. To the right, there is a huge area being cleared for growing Soya beans. This crop is then distributed worldwide mainly as animal feed. Towards the lower centre one can find an illegal farmer, busy planting palms for the palm oil trade. A number of animals are trying to dissuade him: a mouse with a STOP sign, a monkey dropping a large stone on his hand, whilst a giant gerbil is about to give him the fright of his life. Palm oil ends up in a wide variety of products, from fast foods, chocolate and soap to cosmetics and even cleaning products. A snow monkey armed with a rifle and cannon. A grasshopper mouse (shouting orders) equipped with a decorative dagger. A tiny poison arrow frog wearing a helmet, armed with a silver plated pistol. A lemur handing over an M-16 assault rifle to a giant kangaroo rat. A team of meerkats moving a heavy machine-gun into position. A tortoise complete with crash helmet and a delivery of grenades. A trio of chimpanzees are launching grenades at a lumberjack about 3 metres away. If you look really closely you can even see their selection of rocket-propelled grenades and launcher! A clan of prairie dogs are awarding a veteran fighter with a medal, whilst to the left a Philippine tarsier is suffering from shell shock. A mouse can be seen whispering death threats into the ear of a lumberjack, but he’s closed his eyes and put earplugs in…what a coward! Elsewhere, some naughty proboscis monkeys are tying a lumberjack’s legs together. A wild cat is about to shred a logger’s hand to ribbons and a man carrying a large tree trunk is being attacked by a mouse, 2 prairie puppies and a squirrel.